Last year, a computer company FXI has introduced a very compact computer running the Android operating system, called Cotton Candy. The computer processor uses two of Samsung Exynos ARM, is full of common connection as Wifi N, Bluetooth, HDMI and microSD memory card slot. It can be used with any monitor, either from your computer, laptop, phone, tablet PC to TV. Now, Cotton Candy has been slightly improved and ready to communicate to consumers in Norway in place before the end of this month. The rest of the world will have to wait till late summer to experience this exciting device. You may have to pay $200 to enjoy Cotton Candy. 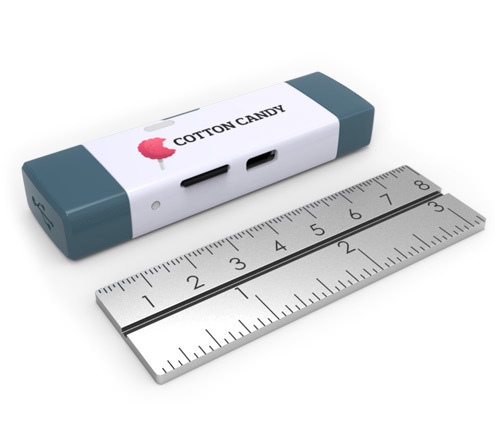 After receiving the Cotton Candy, users need to access http://www.cstick.com/ site to activate the device and select the operating system installed on the target (Android 4.0 or Ubuntu). Then the user can add Cotton Candies and Mac, PC or a removable screen with which to start using.